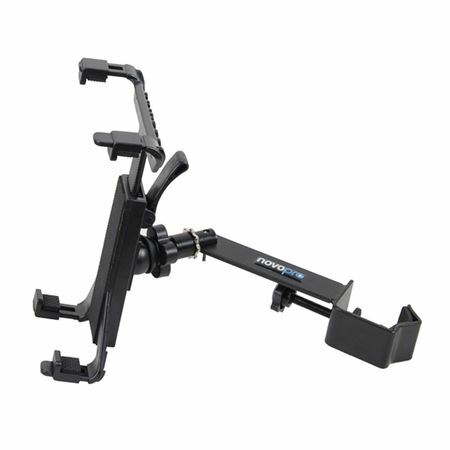 Order your Novopro TAB1 iPad and Tablet Bracket from AMS and enjoy Fast & Free Shipping. Get the Best Deal with our Lowest Price Guarantee & Great Customer Service! Conveniently mount your tablet for use during performance with the Novopro TAB1 iPad/Tablet Bracket. This universal mounting bracket is designed for the Novopro SDX DJ booth, but will fit most stands in the market. It is suitable for all generations of iPad/ Galaxy tabs and other similar size tablets. The universal mounting clamp fits tubes with a diameter of 1″ to 2″. 360° rotation and 15° tilt down and up will insure perfect positioning for performances. A locking system ensures the tablet stays at the desired position throughout the performance.